FODM Board of Directors member helped staff FODM's table. The cafeteria housed 25 exhibitors, including conservation groups, Dominion Energy, Covanta Energy, the National Park Service, Faith Alliance for Climate Solutions, county agencies and others. 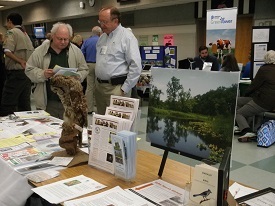 FODMers Greg Crider and George Ledec discussed common interests at our neighboring table and sister organization, the Friends of Huntley Meadows Park. 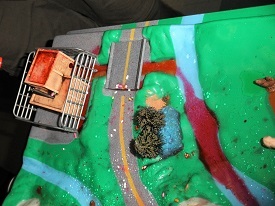 Will Friedman, FODM member, and Patrick Martinez, both with the Carl Sandburg Middle School Eco Club, had a watershed exhibit showing the topography of a watershed. 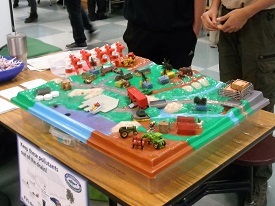 These two conservation-minded middle schoolers demonstrated the impact of human activities on water quality. They applied water on a construction site and a factory. 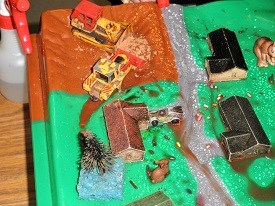 The runoff from each (brown from the construction site, red from the factory) flowed downhill, eventually polluting the river. 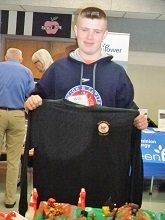 Will Friedman showed off his new FODM tshirt.